There is no excuse to be a bad putter. It is unfortunate, but a one inch putt counts the same—one stroke—as a three hundred-yard drive. Putting is the most personal of all the strokes in golf. However, there are a few common denominators of a good putt. Distance Control; i.e. touch, is the golfer’s ability to judge how hard to strike the ball in an effort to make the ball go a required distance into the hole. Of the four key factors in putting, distance control is the most important. Without an idea of how hard to strike the ball, you have no basis for determining what line to hit the ball on in order to make putts. Everyone has the ability to have exceptional distance control. Simply stand a few feet from a friend and toss a ball to him. Now take a few steps back and toss it again. Did you have to think how hard to toss the ball either time? Did you toss the ball too far or too short? This tossing is very similar to putting. An easy way to develop distance control is to develop a stable tempo. Tempo is about smooth, symmetric motion. Everyone has a “built in” tempo, i.e. rhythm, which is instinctive, fast, slow or intermediate. If you try to use a tempo that does not match your own, you will cause yourself much grief. Now that you have developed good distance control you can read putts more effectively. 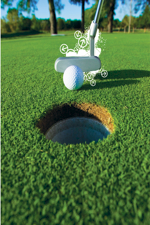 Begin your read of the putt approximately three feet behind the ball, keeping the ball between you and the hole. Once you have determined the amount of slope in the green, determine the apex of the curve. Next determine where the apex is between your ball and the original apex. Keep doing this until you are back at your ball. By the time you get back to your ball, you will have a line perpendicular to your putter face to start the ball on. The most effective way to learn green reading is practice. Through practice you will determine if you played too little or too much break. With this new knowledge, you cannot help but become a more efficient putter. Technique is the golfer’s ability to put an efficient and consistent roll on the ball, at the same time, sending the ball straight away from the putter face. The proper set-up allows us to produce a simple, repeatable motion. Once established, we can consistently move the putter head’s sweet spot squarely into the center of the ball on the intended line, producing an efficient and consistent roll straight away from the putter face. Setup: Feet are approximately shoulder width apart. All joint pairs—ankles, knees, hips, shoulder, are parallel to the intended starting line of the putt. Eye position is either directly over the ball or slightly to the inside of the ball, never outside the ball! Ball position is off the instep of the golfer’s front foot. For golfers with more shoulder tilt, the back of the ball will be even with the front instep. For those with less shoulder tilt the front of the ball will be even with the front instep. The shaft should be vertical and pointed to the golfer’s front ear. The closer we get to completing a hole, the smaller the target becomes. The fairway is approximately 35 yards wide, the green 20 yards wide and the hole a mere 3 ¼ inches! Such a drastic change in target size makes even the most accomplished professional tense with anxiety. The body does what the mind tells it to. Telling yourself, “Don’t 3-putt” is a recipe for disaster. Your body and mind only deal in what “to do.” Negatives such as “don’t” or “try not to” are not recognized by the mind/body. The mind/body only picks up action parts of thought, 3-putt, leave it short…, and will follow what goes through the brain. You will be much more productive by telling yourself what you wish to accomplish. The part of the brain telling you what not to do is the same part that tells you what to do. If you occupy your brain with “to do’s” you will be much more successful. A simple way is to begin each phrase with “I will.” For example, “I will make this putt” or “I will land this 40-footer close to the hole.” Hearing these words has a very powerful effect on a golfer’s psyche. Once the putt is read, you have gotten a feel for distance and told yourself what “to do,” the last thing is to commit to your plan. Any second guessing does nothing but inhibit your stroke. You had a reason for your initial read, usually developed from practice and instinct. If your initial read was wrong that is okay; learn from your mistakes. If you did not make any mistakes, you would not be reading this in the first place. For help with your golf game contact the Golf Performance Academy at (843) 338-6737, or visit us at golfacademyhiltonhead.com.